First of all, you want to be able to say yes and no. That’s the easy part. If you want to say yes, say „Ja“. „Ja“. If you want to say no, say „nein“. Nein. When travelling in a foreign country, it is important to be nice to the people you meet. After all, everything you do will reflect on your own country. If you’re an American and you’re acting loud the Germans will say: Americans are loud! So be careful what you do! Our next words are please, thank you and sorry or pardon. If you want to thank somebody for something, you simply say „Danke“. Danke. In reply to that, the other person will answer „bitte“. Bitte. If you want to attract the attention of somebody, for example a person working in a store, or if you bump into somebody, you say „Entschuldigung“. I know this is a hard word to say and everybody will understand if you say „sorry“, but the correct German word is Entschuldigung. Ent-schul-di-gung. Alright, very good so far! Now let’s get to four words that you can use for directions. There is left and right. Left is links, links, and right is rechts, rechts. It’s easy to memorize, because the first letter of the words is the same. Links and rechts. In rechts you have a sound that is not common in many other languages, the „ch“-Sound. Your mouth forms a wide grin, like if you want to say „eeeee“. Now if you lift the middle part of your tongue a little bit, you will get this sound. „Ch“. Two more words for directions: Up and down. Up is „oben“, oben, and down is „unten“, unten. Let’s get to different greeting formulas. You can always say „Guten Tag“, no matter what time it is. It jus means „A good day to you“. If you want to specify, you can wish a good morning or good evening. Then it is „Guten Morgen!“ or „Guten Abend“. Guten Morgen. Guten Abend. The more colloquial form is „Hallo“. Hallo. If you are in Southern Germany, in Bavaria or even in our neighbor-country Austria, you will often hear „Grüß Gott“. This means „God is greeting you“, meaning „God bless you“. I am not a Christian and I say it anyway – it is very common in Southern Germany. Grüß Gott. If you want to leave, there are also different possibilities. You can say „Auf Wiedersehen“, auf Wiedersehen, meaning „until we see us again“. The more colloquial form is „Tschüss“ or the Italian „ciao“. Tschüss. Ciao. Auf Wiedersehen! 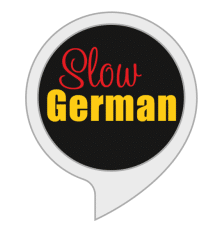 Four more words to go, then we are through with this first episode of Slow German for Absolute Beginners. Let’s say you enter a hotel, or you want to introduce yourself to somebody. Then you say „Ich heiße…“ and then your name. I would say „Ich heiße Annik“. In a hotel, you would follow up with something like „Ich habe eine Reservierung“, if you have a reservation for a room. We also copied the English form of that sentence, so you can also introduce yourself by saying „Mein Name ist…“. Mein Name ist Annik. Ok, now three important places for every traveler. If you travel by train, you need the trainstation. Bahnhof. Bahnhof. If you fly to Germany, you will arrive at the airport, the Flughafen. Flughafen. And if you need a taxi, guess what? You can call a Taxi! I guess that word is the same in almost every language. We just pronounce it a little differently. Taxi. Taxi. That’s it for now, in the next easy episode I will tell you what to say if you’re in a restaurant. If you have questions or ideas what to teach next, write me an e-mail at podcast@slowgerman.com . You can find the text and the vocabulary to this episode as well as many infos on slowgerman.com. Auf Wiedersehen! Or better: Auf Wiederhören! This episode is too easy to learn us how to pronounce the German alphabet.